Is Cats the purr-fect musical? Andrew Lloyd Webber’s musical ‘Cats’ is coming our way, this triumphant revival has been wowing audiences in Melbourne and Sydney. Perth will be the next city to head to the Jellicle Ball. OUTinPerth chatted to performer Ross Hannaford who plays Skimbleshanks in the musical. Appearing at the Crown Theatre won’t be a new experience for Hannaford, he’s previously performed in ‘Wicked’, ‘We Will Rock You’ and ‘A Chorus Line’. When you play a cat do you find yourself studying cats all the time? I used to, but not so much anymore. There’s always an endless supply of funny YouTube videos of cats. We did have to study them a lot in rehearsals, but we’ve been doing the show for a while now so I’ve got that down now. When did you first come across this musical? Oh, way back when! I think it was when Debra Byrne was playing it for the second time in the early ‘90s. That’s my first recollection of it. I was about six or seven and my parents took me to see the show. It was one of the first musicals I ever saw, so I feel like I’ve come full circle to be playing in it now, it’s quite special. What’s the highlight of this show for you as a performer? I love that it’s an ensemble piece, everybody in the show gets their moment to help carry the story along. It’s not stale in any way, we all get choices to make every night, so every show is different. Every show is unique. There’s no chance of it becoming boring because you have to make new ‘on the spot’ choices every night. I find that quite refreshing having come out of some of the major musicals out of America where there are very specific about where you stand and the way you travel, there’s no deviation. We get to make choices each night and that keeps it alive and in the moment. 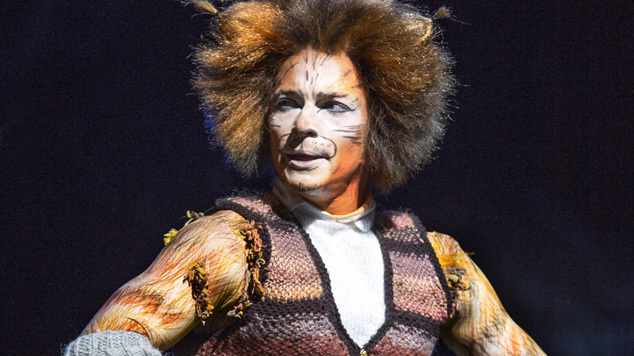 The songs and music from ‘Cats’ have a certain ‘ear-worm’ quality, do the tunes get stuck in your head? They do! We’ve done over a hundred performances now and they’re not the sort of songs you want stuck in your head when you go home from work, but there it is. I respect this show because you can go away humming the tunes. I’ve see a lot of musicals where later you can’t remember a single tune, but this one is very catchy, I think that’s why people have such nostalgia for it and want to see it again. How long does it take for you to transform into a cat? It depends how fast you want to get it done, I’ve got it down to about twenty five minutes, but then there are other days where you’re not rushing, yesterday it took me an hour and fifteen minutes. It’s the most preparation that I’ve ever had to do for a musical, because it’s all three disciplines, singing, dancing and acting you have to do a lot of warm ups. What do you think a queer audience might get from ‘Cats’ that other audiences might not appreciate? It’s a big spectacle that everyone can enjoy, but I think the queer community really understands what it is to be ‘the other’ or a minority, and the central role of Grizabella, she’s most definitely an outcast and she’s judged by the community. In the show our spiritual leaders teaches us to accept her, and that only comes from self-understanding and finding the capacity to understand, it’s a beautiful storyline.